iTunes store has a lot of video resources like TV shows, movies and public lectures. And as we all know, videos we download from iTunes are usually in M4V format and protected by Apple’s Digital Rights Management(DRM)technology and normally we cannot further process the videos like transferring them to Android devices or burning them to a Blu-ray disc. But there are ways to make them happen. In this post you would find instructions that would guide you to convert iTunes DRM M4V to ISO image files and burn them to disc. The first thing to do with converting M4V to ISO file is to remove the DRM protection from M4V video. Leawo TunesCopy is a powerful iTunes DRM removal tool that can help you remove the DRM protection from the M4V video and convert the video into MP4, a more universal video that can be played by other players and devices. What’s so great about Leawo TunesCopy? 1. Remove DRM from iTunes videos, movies and TV shows. 2. Convert DRM protected M4V video to universal MP4 video. 3. Fast DRM removal speed. 4. 100% reserve original audio tracks, subtitles and AC3 Dolby 5.1 surround sound. Below are the instructions for using Leawo TunesCopy to Convert M4V with DRM protection to DRM-free MP4 video. Open TunesCopy, on the main interface, click “Add Files” button on the sub-menu bar or “Add Files” button in the middle of the interface and the program would automatically scan all the rental or purchased M4V files on your computer and list them on the pop-up window that comes up right after you click the “Add files” button. Choose the files you want and click “Add” button or add all the files to the interface at the same time by clicking “Add All“. If there are audio tracks and subtitles in the video, you can click the Edit button on every file to choose the subtitles and audio tracks you want to keep in the output MP4 video. At the bottom of the interface you could see the “Output” option and the default output directory. If you want to change the default output directory, click the button next to the directory to set a new output directory for the output MP4 video. After finishing all the above steps, click the Convert button on the bottom right to start removing DRM protection from the M4V video and converting M4V to MP4 video. Before the program starts the conversion, you will be asked to authorize the computer to play the video you are converting if you haven’t authorized the computer before. The next step is to convert the converted M4V video(aka.MP4) to ISO file so that you can burn it to disc. 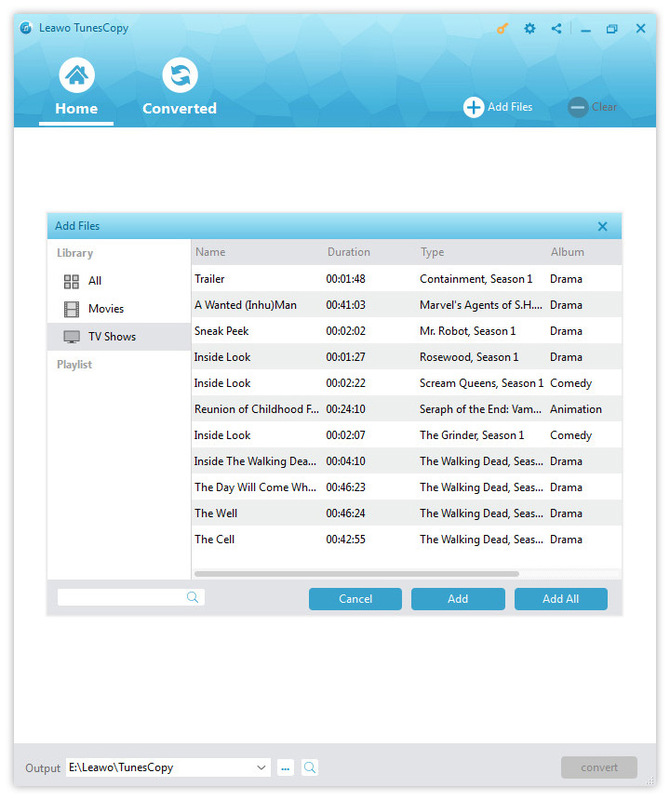 Leawo Blu-ray Creator is a powerful tool that’s capable of burning video directly to Blu-ray/DVD disc and converting the video to Blu-ray/DVD folder or ISO file. With it you can easily convert M4V to ISO file for burning MP4 to Blu-ray/DVD disc. To learn how to use Leawo Blu-ray Creator to create ISO file out of MP4 video, please refer to the instructions below. 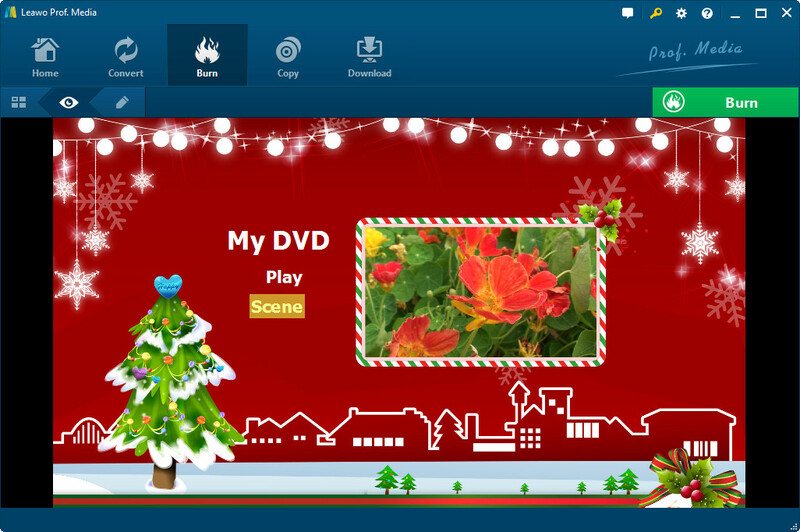 Download Blu-ray Creator from Leawo’s official website and install it. You should notice that it’s included in a software package named Leawo Prof. Media. Open Prof. Media and click on the Blu-ray Creator tab to enter Blu-ray Creator interface. Add MP4 file to the program by clicking Add Video button and choosing the target video from your computer or directly dragging the file to the interface. Before you start converting MP4 to ISO image file, you are allowed to edit the video first. There’s an Edit button on every video, click it to enter the video editing panel. Select a disc menu from the preset disc menu templates from the sidebar on the right. Move your mouse over on one template and you would see a Preview button on it, click it to go to the disc menu preview panel. If you don’t need to add disc menu, click “No Menu” template. Click the big green “Burn” button on the top right to call out the sidebar for Burning Settings. You can choose to burn M4V to Blu-ray disc, or convert M4V to ISO File, or/and Blu-ray folder. Choose saving destination in “Save to“. You could choose multiple targets under the “Burn to” option. Below is Leawo Blu-ray Creator’s video guide, check out the video to learn how to use Blu-ray Creator to do things like editing video, customizing disc menu and burning video/ISO to discs, etc. This video should be able to help you learn how to burn iTunes DRM M4V to ISO. Now the whole process of converting iTunes M4V to ISO image file is finished. With the help of TunesCopy and Blu-ray Creator, it’s easy to convert M4V to ISO file on your computer.